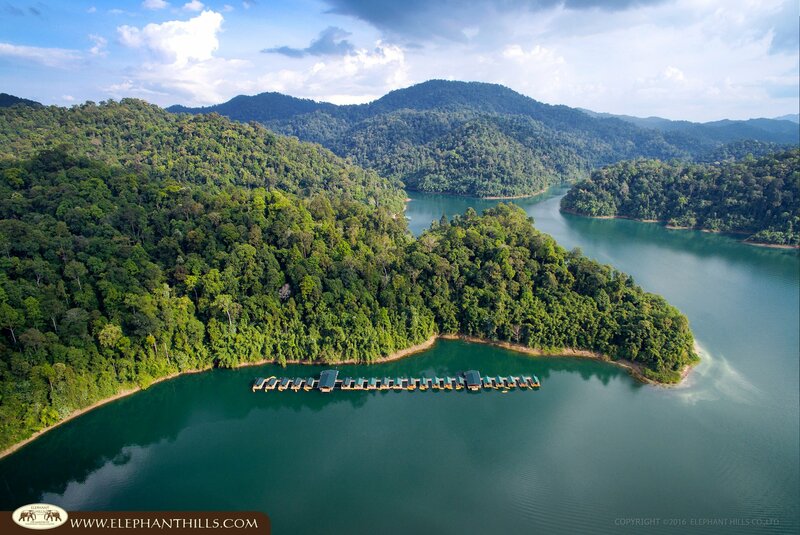 Nestled in the province of Surat Thani lies a National Park unlike any other. Home to a vast array of wildlife, and with ecotourism at the centre of all that we do, what we offer here is utterly unique. We know that everyone who visits us will leave spellbound, but if you need any more convincing to visit Khao Sok, here are our top ten reasons to book a trip. Far (enough) from the maddening crowds, Khao Sok National Park is around three hours’ drive from Phuket, allowing you to get the best of both city and country, beach and forest, out of your holiday. If you are stretched for time it’s possible to organise a day trip, but if you really want to make the most of your time and explore all that the park has to offer, we recommend visiting for at least two days. For visitors arriving from Koh Samui, transfers are included in all our recommended tours. You will be collected from your accommodation and transferred to Khao Sok, with ferry travel included. Getting here couldn’t be easier. Find out more here. prehistoric limestone cliffs, learn about the history of the area from a local Thai guide and enter caves which slowly formed over millions of years. The tours that are available in our park are unrivalled for combining history, activity and fun. 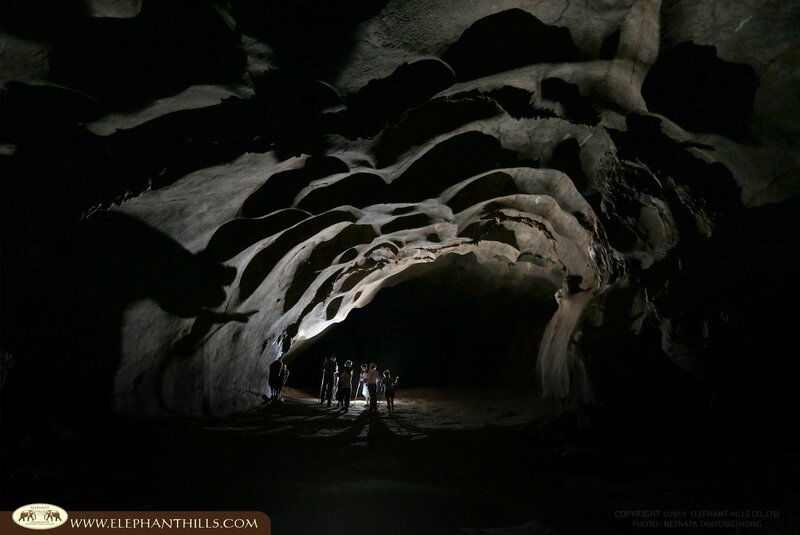 And if the idea of being in a dark underground cave seems a little daunting, don’t fret. We only work with the most reputable tour operators, so you can rest assured you’re in the best possible hands. 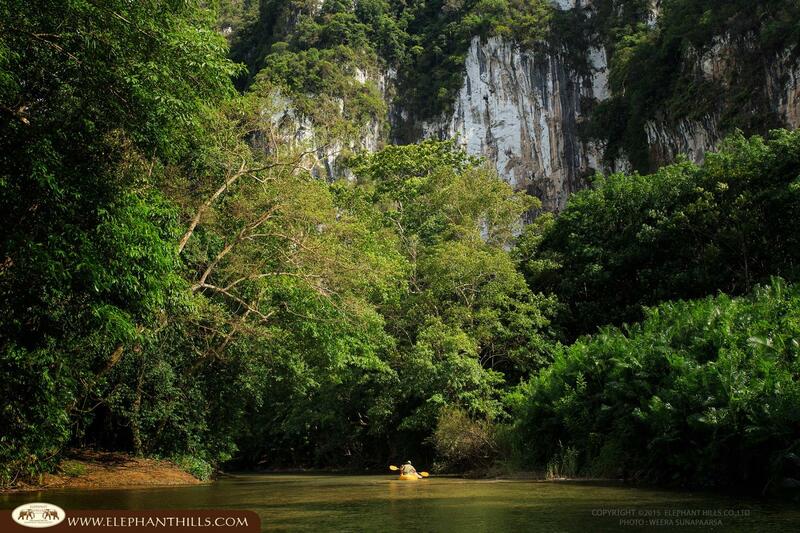 Surrounded by such amazing scenery, what better way to explore Thailand’s tropical rainforest than by boat? Getting out on the water is a must-do while you’re visiting, so why not join a tour that includes a guided canoe safari and coast down the Sok River with an English-speaking local guide pointing out wildlife and explaining plant species? Canoeing is a great way to see the sights and is the quietest method of transport if you’re hoping to spot some of our more timid little creatures, such as spectacled langurs, on your journey. Not into groups? No problem! Kayaks are included with all of our recommend tours, giving you the freedom to explore when, where, and how you choose to. Unlike many areas of natural beauty, because of Khao Sok’s ecotourism ethos, it is neither built up, nor lacking in facilities. 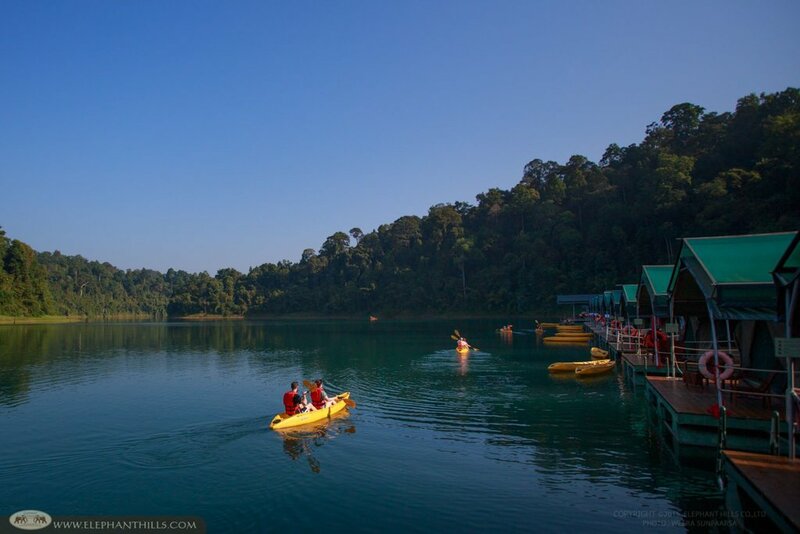 A variety of lodges and resorts are located in nearby Klong Sok village, but if you want to make your stay truly memorable, head to the floating tents on Cheow Larn Lake. Rainforest Camp is a unique development of elevated, luxury, canvas tents. Boasting all of the creature comforts, including private bathrooms, deluxe beds and two restaurants, you can experience all of the best bits of camping and resort accommodation, combined. With stunning views and a kayak in front of each tent, we think you’ll agree that Rainforest Camp is reason enough to visit Khao Sok. 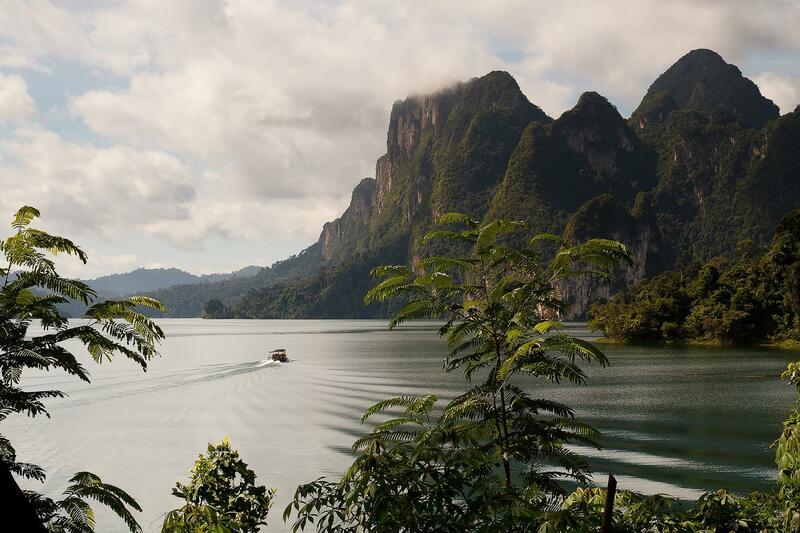 Cheow Larn Lake sits within the Khao Sok National Park and its 165 km2 area is lined by a towering, limestone, mountain range. Described by some as “a more beautiful Halong Bay, without the tourists”, areas of eroded cliffs emerge from the blue-green lake in truly breath- taking formations. The cliffs are thought to have been formed at the same time as the Himalayas, when the Indian and Eurasian plates began to collide 50 million years ago, forcing the rocks up and creating the towering karsts you can now see. Whether you’re intrigued by geology or not, it’s impossible not to be awestruck by the sheer scale and drama of the landscape. Khao Sok National Park is home to a diverse range of creatures great and small, over 350 in fact! Exotic birds and primates fill the trees, while the forest floor is home to an array of insects including the recently discovered Scolopendra cataracta, the world’s only known amphibious centipede. 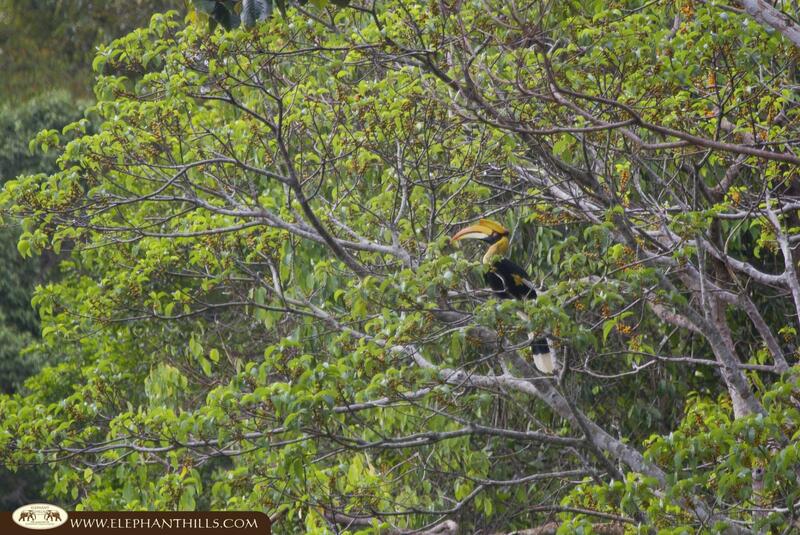 Take a trek deep within the rainforest and you may encounter a pangolin, tapir, gaur, deer or even a wild elephant! 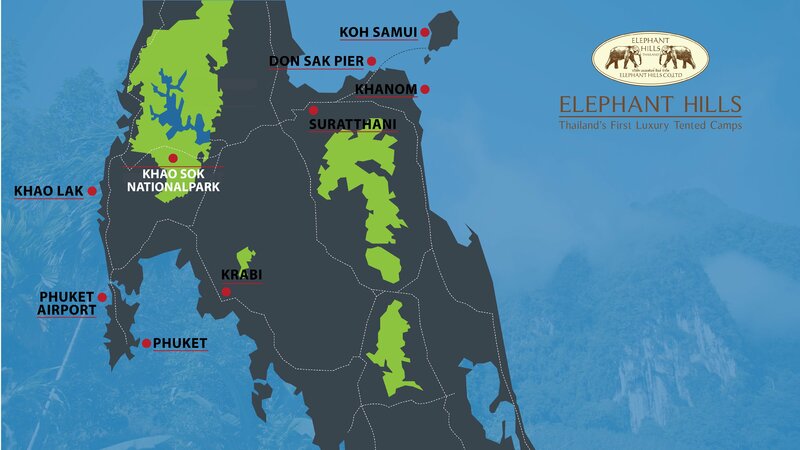 Yes, you read that correctly, Khao Sok National Park is home to families of wild Asian elephants. There are few places still so untouched by man, that allow animals to thrive in their natural habitat – we’re exceptionally proud to be one of them. The rainforest in Khao Sok National Park was once part of a much larger area and research has shown it to be older even than the Amazon. A mixture of evergreen and tropical rainforest, the flora in the park thrives, protected by a team of dedicated rangers, conservationists and locals. A diverse range of plants grow in this region, among the more common varieties such as bamboo, liana and mangroves, are jackfruit, pomelo, mangosteen and banana trees. The forest is also home to the province of Surat Thani’s official flower, the Bua Phut (Rafflesia kerrii). The flower reaches up to 90cm in diameter and blooms for only a week before dying. Book your visit in January through March for your best chance of spotting this rare flower. This area of Thailand’s tropical rainforest spans 739 km2 and is the largest area of virgin rainforest in Southern Thailand. An ideal respite for when you’re tired of the hustle and bustle of nearby cities or just need to escape from daily life, the rainforest has a magical way of reconnecting you with nature. 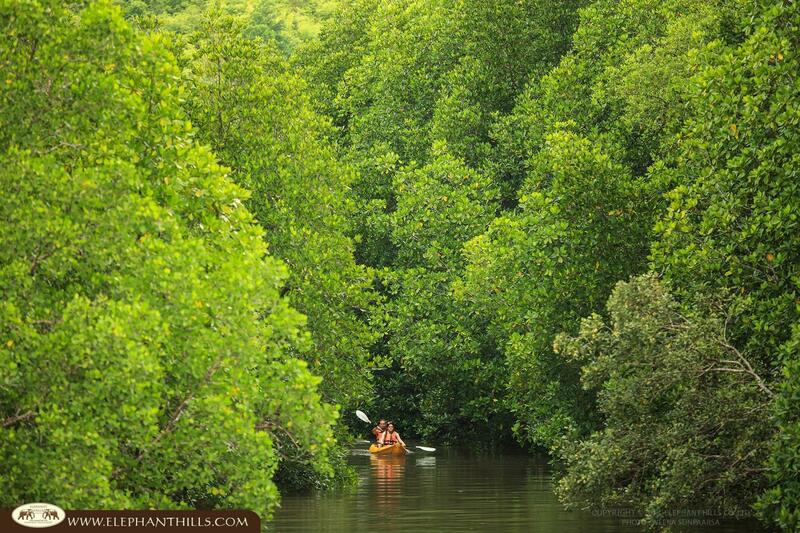 Whether you’re listening to the birdsong along one of our trails or discovering Cheow Larn’s ancient coves by kayak – there’s no better place to pause, rest and appreciate the splendour of the world around you. Ok, the elephants may have already had a mention, but they deserve their own place on our list. The opportunity to get up close and personal with one of these gentle giants is something you simply MUST do when you visit – it’s the highlight of most guests’ trip. Being advocates of ecotourism, it’s incredibly important to us that elephants aren’t exploited for the benefit of humans. As such, we recommend visitors avoid commercial ‘elephant treks’ and instead visit a conservation park. In our local area there are elephant facilities which adopt a ‘do no harm’ approach to elephant tourism. 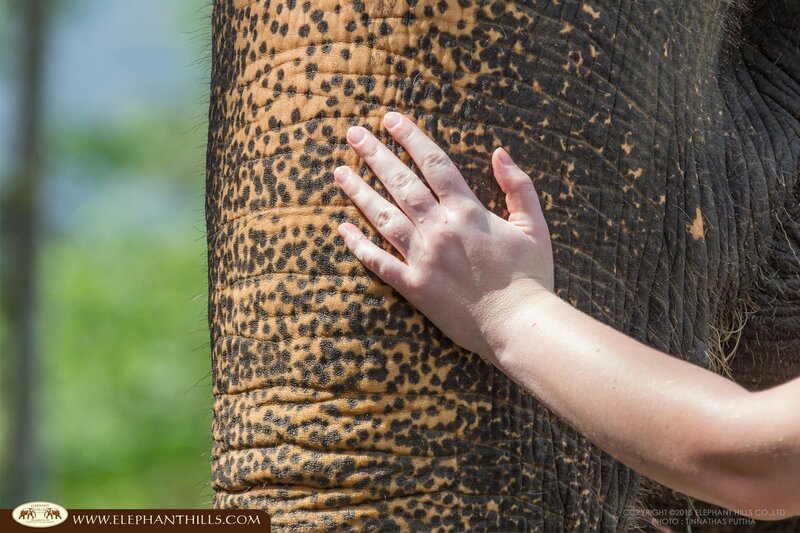 They allow you to not only meet elephants, but feed, wash and interact with these amazing creatures in an ethical way. It is a truly awe-inspiring experience and connects you with nature in a way unlike any other. Can you feel the love tonight? We can, and you will too. Strictly speaking our #1 spot doesn’t stand on its own but is rather a collaboration of other elements on our list. What do you get by combining the lush, peaceful environment of Thailand’s tropical rainforest with stunning tented accommodation, wildlife that is out of this world and active tours that have to be experienced to be believed? You get a once in a lifetime adventure of relaxation, discovery and wonder. There is nowhere more romantic for a honeymoon or holiday in Thailand than Khao Sok. So, what are you waiting for?! Pack your bag, book your flight and visit Khao Sok National Park for an experience that we guarantee you’ll never forget.